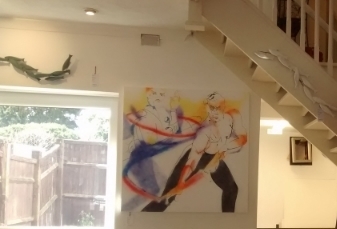 It was lovely to see the three dance paintings hanging at the Portico Gallery, Riverhead in Kent. They looked fresh and strong, a good size too for the gallery space (1m x 1m). This was the second time I had exhibited there, the first time I had a solo show about 10 years ago with another gallery owner. The Portico is a friendly gallery, one that welcomes you in. I had a few gifts to buy too and they have a great choice of original pieces. 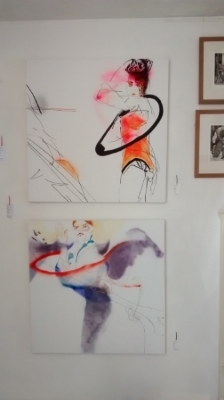 Three dance paintings at the Portico Gallery, Riverhead, Kent. These will be on show at the Brighton Open House, below. Now for the Brighton Open House info. I will be exhibiting for the 4 weekends in May as part of the Brighton Festival 2015. This may be the 15th or 16th year I have exhibited with my friend and ceramacist, Frances Doherty at her house, 31 Havelock Road, Brighton. If you would like to come along or receive details please email me.